Some investors in gold and gold coins may decide to keep their investment in a safe at home. But doing so begs the question, which safe to use? And should you insure the gold you have? Gold storage at home does have some risks involved, one of which being if you lose your gold it is gone. 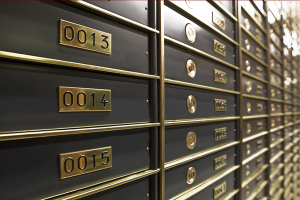 To help counteract this risk, some investors choose to diversify their storage methods, meaning that they might keep part of their investment at home, and part in a vault or a gold storage box. Storage with Gold Investments is cheap (only £4.00 per ounce per year) and fully insured. However, one major advantage to storing your gold at home is that you know exactly here it is at all times. If you are considering keeping some, or all, of your gold at home, here is how to do so. If you are in the market for a safe, there are a few things to keep in mind. First of all, safes can range in price from £30 to thousands of pounds. It is recommended to buy your safe in cash if possible, because one of the main things to consider when storing gold at home: the fewer people who know you have gold in your home, the better. Paying with cash would take, at least, your credit card company out of the mix. You also may want to consider purchasing a safe that can be installed in a wall or in the floor, so that potential intruders cannot find it and carry it away. In any case, it is important to find a safe that is fireproof, protected against other elements, such as water damage, and if you choose to bury it as some investors do, insect-proof, air-tight, and erosion-free. There are a few things to consider when deciding to store gold at home, so it is important to research all options before deciding which safe to use for the most secure gold storage possible. Most homeowner’s insurance policies cover cash-related items, however the coverage provided is usually relatively low. You may consider finding another insurance policy to cover whatever gold you have stored in your home. In this case, it is also important to consider that having your gold insured by an insurance company would mean that another person knows that you are storing gold at your home. It is wise to shop around for insurance policies that would cover precious metals and other valuables, and not solely depend on your homeowner’s insurance, as they may pay out far less than your gold is worth should anything happen to your home. Whether you have invested in gold bars or gold coins, keeping some at home can provide a fair amount of peace of mind, especially if you have a strong safe and good insurance covering your investment. Alternatively, you could choose to store your precious metals with Gold Investments. Our competitive rates, brought about due to our relationship with London Silver Vaults, can often be less expensive than insuring gold in your home.